This hotel is located on the best beach of the Riviera Maya in a spectacular natural setting. Its architectural design was inspired by colonial culture and provides each space with its own unique character. The resort's 756 guest rooms on three floors offer cable/satellite TV with pay movies. 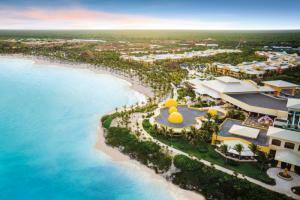 Guests may choose from Brazilian, French and Mexican cuisine, an expansive selection of brand name beverages and have guest privileges at neighboring Barceló Resorts. Resort occupies a mile of prime beachfront property in the exclusive Mayan Riviera area. Two buffet restaurants, three specialty dining restaurants, and multiple bars. Guests may also dine at any of the restaurants in the Barcelo complex. Tres Rios Ecopark, Xcaret, Xel-Ha, Aktun Chen, Sian Ka'an Biosphere Reserve, Xaman-Ha Aviary.